AN IPSWICH institution, with a history as old as the city, the Queensland Lodge No 2 is opening its doors to the community in the search for new members. Once famed for their secrecy, the Freemasons have welcomed the public into the lodge, and are keen to see more come through the doors. Ian Brown, secretary of the lodge, said it meets during the day, to provide an option for those unable to attend night meetings. "By meeting in the daytime, we can have an active social program in conjunction with our lodge meetings," Mr Brown said. "We are not a secret society, we are a men's club, and we would like to see more younger members joining the lodge." Tom Lane, the Worshipful Master-elect of the lodge, described freemasonry as a 'young man's activity', that provided a 'guiding light' for younger men. "It is also a way for men over 60 to reconnect with the community, often there is a loss of connection through retirement, separation or even becoming a widower," Mr Lane said. "They often have a limited social interaction with the general community." Mr Brown said people 'get out of it what you wish'. "We practice and preach morality, by learning the rituals they become part of your life, it is a way of life, a way to bring your family up." Mr Lane said the Freemason movement has a strong focus on charity, with the lodge raising $37,000 in the last 10 years for Ipswich-based charities. "Importantly, we don't give people money, we find out what they need and arrange the supply of the item, it might be a fridge, or a bed, direct to the person." Mr Lane said as well as local fundraising, the lodge is supported by Freemasons Board of Benevolence, which matches all local donations, effectively doubling the amount raised locally. 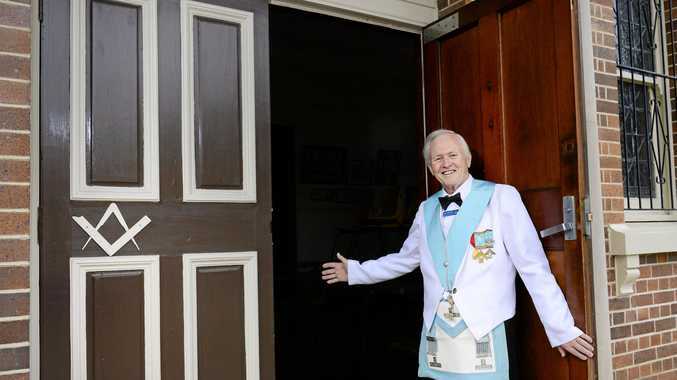 While the lodge's ritual remain a closely-guarded secret, Mr Lane said the recruitment of new members was becoming less constrained than in the past. "To become a mason, you must be a person of 'good standing', with a belief in a Supreme Being, although we are not religion-specific, and you must swear allegiance to your country." Mr Lane said all the rituals are done 'within sight' of an open bible, although he stressed Freemasonry was not a religion. "There are two topics that are banned from every meeting, religion and politics, this does not preclude personal beliefs, only that they are not discussed during meetings. "Freemasonry is a lifetime of commitment, it is not uncommon to see members with 50, 60 or even 70 year jewels, Ted Smout, the last ANZAC, received his 80 year jewel for service before he passed away." With a history that stretches back over 1,000 years, Mr Lane said Freemasonry was an early form of trade unionism, with a mix of verbal and written history, and all meetings had prescribed processes that were recorded in the rituals, covering all elements of freemasonry from initiation to elevation and installation. "As apprentices progressed in their trade, they were given a word, which they could take to their next employer, and it would denote their qualifications in the profession. "You owe duties to God, your neighbour and yourself." The Queensland Lodge Number 2 meets at the Masonic Lodge, 9.30am on the second Wednesday of the month, with more information available from Ian Brown on 0431 034 852.